1 Possession Limits: three times the daily limit for all species during each of the corresponding seasons. Exceptions: light geese and crows have no possession limit. 2 Mergansers including common, red breasted and hooded, in aggregate of which only 2 may be hooded. Merganser limits are in addition to duck limits. See Duck Limits, above. 3 See special regulations only for September Canada goose hunting, Migratory Bird Regulations. 5 Special Sea Duck Area: All New Jersey coastal waters seaward from the International Regulations for Preventing Collisions at Sea (COLREGS) Demarcation Lines shown on National Oceanic and Atmospheric Administration (NOAA) Nautical Charts and further described in 33 CFR 80 Districts 1 and 5. Applies to hunting duck, coot, merganser, regular season Canada goose, brant, regular season light goose and Youth Waterfowl Days. Coastal Zone: That portion of the State seaward of a line beginning at the New York State line in Raritan Bay and extending west along the New York State line to NJ 440 at Perth Amboy; west on NJ 440 to the Garden State Parkway; south on the Garden State Parkway to NJ 109; south on NJ 109 to Cape May County Rt. 633 (Lafayette St.); south on Lafayette St. to Jackson St.; south on Jackson St. to the shoreline at Cape May; west along the shoreline of Cape May beach to COLREGS Demarcation Line 80.503 at Cape May Point; south along COLREGS Demarcation Line 80.503 to the Delaware state line in Delaware Bay. North Zone: That portion of the State west of the Coastal Zone and north of a line extending west from the Garden State Parkway on NJ 70 to the NJ Turnpike, north on the turnpike to U.S. 206, north on U.S. 206 to U.S. 1 at Trenton, west on U.S. 1 to the Pennsylvania State line in the Delaware River. 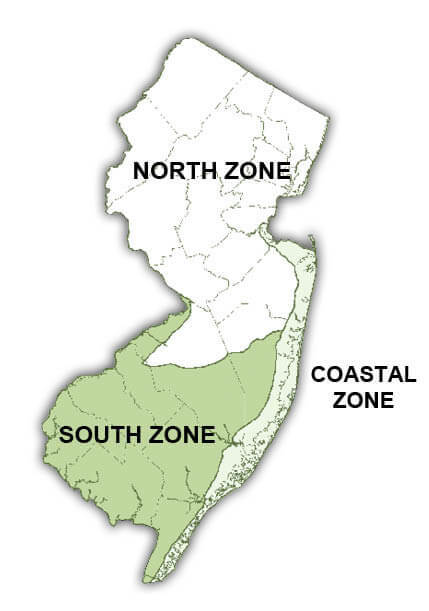 South Zone: Portion of the State not within the North Zone or the Coastal Zone. The area defined as all New Jersey coastal waters seaward from the International Regulations for Preventing Collisions at Sea (COLREGS) Demarcation Lines shown on National Oceanic and Atmospheric Administration (NOAA) Nautical Charts and further described in 33 CFR 80 Districts 1 and 5. North Zone—North of Rt. 70 from Point Pleasant to Camden. South Zone—South of Rt. 70 from Point Pleasant to Camden.